Particularly suitable for individualists is our beautiful old circus wagon. He is covered and protected on a large meadow on the paddock with stunning views of the Pyrenees and the Gorges de Galamus, a spectacular gorge on the way to us. The Roulotte can accommodate two people, with double bed, a small built-in kitchen and dining area. Grown is a covered porch, a dry toilet, a pantry with fridge and a private house with possibility for hot showers and washing. The sanitary and technical installations are straightforward, ideal for people who do not need comfort, but want to enjoy pure nature. Despite this, there is electricity and WLAN. The circus wagon is on sight to our house and a guest cottage on the edge of our tiny village of Les Baillessats. 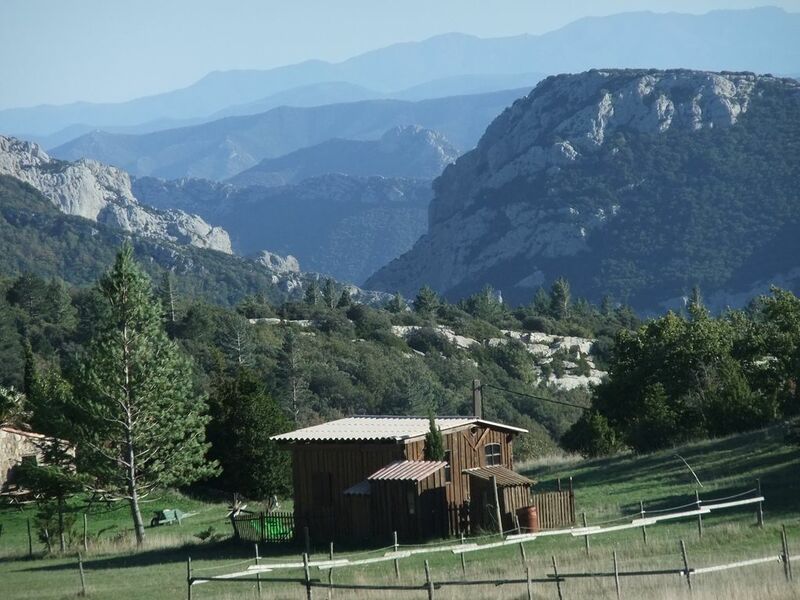 Our village "Les Baillessats" is not affected by the stress of tourist resorts or big cities around 650 meters high in the Cathar, between the Corbières and the Pyrenees, about 50 km west of Perpignan, near the Spanish border. Only a small road leading to it, there is no through traffic, no streetlights. Even on many regional map it's not even located. Live here in total about a dozen adults and a handful of children affected by the stress of civilization and try to simply and close to nature to live and work. All residents of the village speak German, but most of them also French. Les Baillessats is no star resort, but offers an original holiday resort of charm, an ideal base for magnificent experiences in the region. Or simply the calm, look for the many. Customers - if they like - Contact to cats, dogs, horses and chickens, overlook a wonderful Pyrenean scenery and experience the unhurried serenity southern French way of life. From Les Baillessats you can reach quickly several beautiful bathing facilities as spectacular gorges with cascades and crystal clear water basins, lakes and the Mediterranean Sea. Sightseeing enthusiastic about the nearby Cathar Queribus, Peyrepertuse, the medieval fortress city of Carcassonne and Villefranche de Conflet, the "Da Vinci Code" who finds a base in neighboring Rennes le Chateau, or the mysteries around the Pic de Bugarach. In the region sport-oriented vacationers can go hiking, biking, climbing, canoeing and much more. In the Gorges de Galamus Canyoning is offered. Spain, Andorra, and other objects offer themselves as possibilities for day trips. Les Baillessats as a starting point for countless tours and as a retreat following an eventful excursions offers surprising comfort and an individual holiday home. Directly from the house you can go to our well-trained horses magnificent rides in the varied surroundings. For beginners - children and adults - we offer individual lessons and bring the handling of the horse closer. You can place in St. about 10 km away Paul shopping (market, supermarket, etc.). Restaurants and small bars can be found in almost all the villages. We are happy to give advice on this. A cozy meeting place for guests and villagers, is our little pub "Barabar". On selected days and they can eat here trifles, drinking delicious wine and celebrate together a bit and chatting. Perfect: you do not go away to times not to cook for themselves, the children get finally their chips, newcomers can on the first day to relax without the oven having to fire up and shortly before departure, you can eat well without simmer with packed suitcases again himself to have to. Arriving guests can order a snack already for the first evening at interest. Obviously this isn't 4 star living, but if you expect that, why have you booked to stay in an old gypsy caravan? Lovely bijou caravan and porch very well sheltered so spent most time there eating and drinking outside. The mountain setting is beautiful and the surrounding countryside is gorgeous. If the mountains are a bit damp (we went in October) then the beach is only 1.5 hrs away and the weather will be cracking there. Lots of great places to visit. Would definitely return. Barbara very helpful with suggestions of where to go and what o do and nothing too much trouble for her. Barbara ha sido una anfitriona super amable. El lugar es precioso, pintoresco y cómodo para desconectar unos dias. Le seul bémol dans cet endroit majestueux, l'isolation de la douche (la météo n'était pas avec nous). 3 nuits juste fabuleuses pour visiter les Châteaux Cathares et faire la connaissance de ce secteur géographique particulièrement riche. Pour conclure, pour les nostalgiques de "La Petite Maison dans la Prairie" et si vous aimez un cadre naturel, verdoyant avec vue sensationnelle, c'est là qu'il faut aller, sans la folie du monde actuel dans laquelle nous baignons quotidiennement en recherche du "toujours mieux". In our well-trained horses rides, overnight trekking and riding lessons are possible at any time.